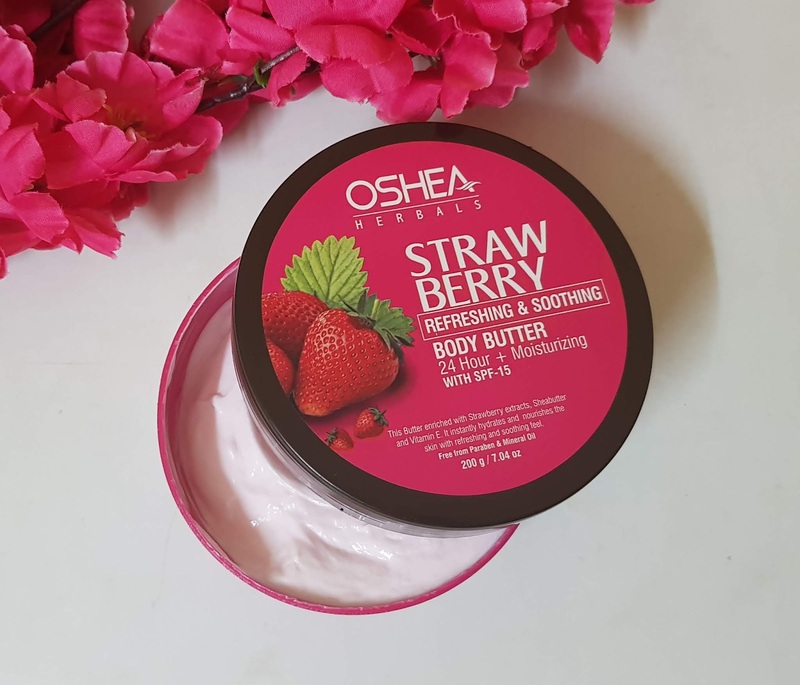 Oshea Herbals Soothing and Refreshing Strawberry Body Butter Review! 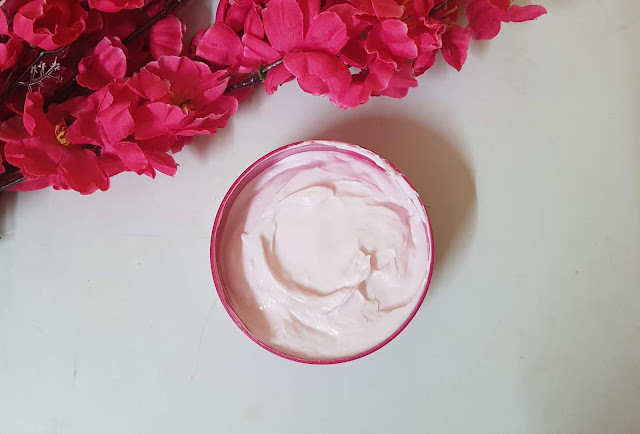 - Indian Beauty Network Soothing and Refreshing Strawberry Body Butter, Let's see how it fares. 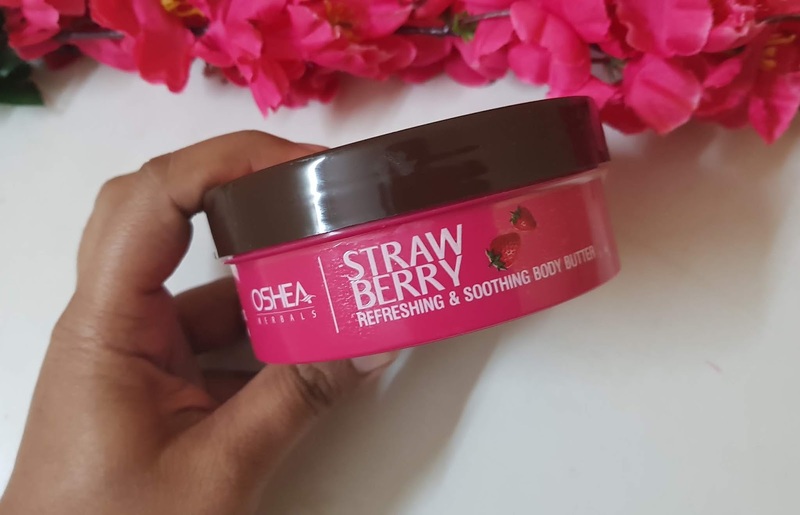 Oshea Herbals Soothing & Refreshing Strawberry Body Butter Review! NAME OF THE PRODUCT: Oshea Herbals Soothing and Refreshing Strawberry Body Butter. PRICE: Rs. 325 for 200gm. This body butter has been enriched with Strawberry Extracts, Shea Butter and Vitamin E and is congruous for all those who have been longing for soft skin even in winters. It is an Ultra-Pure Body Butter which is Paraben and Mineral Oil free. It is specially formulated with natural ingredients for reinstating the lost moisture content from the skin during winters while it also moisturizes the skin with its Sun Protection Factor-15. It also contains sunflower oil, glycerin, aloe vera extracts and cocoa butter. It must be applied in circular motions until the butter is absorbed by the skin. 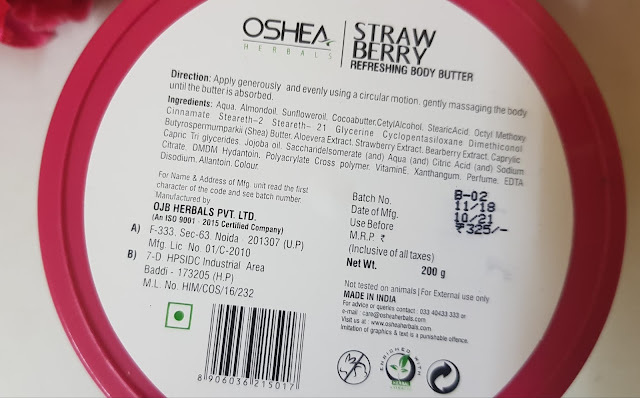 Oshea Herbals has introduced its new 24 Hour Moisturizing Solution, Strawberry Body Butter, which claims to instantly hydrates and nourishes the skin while leaving a refreshing and soothing effect. I always wanted to try The Body Shop body butters but the price tag keep me away. This looked a bit similar and I am excited to try this out. 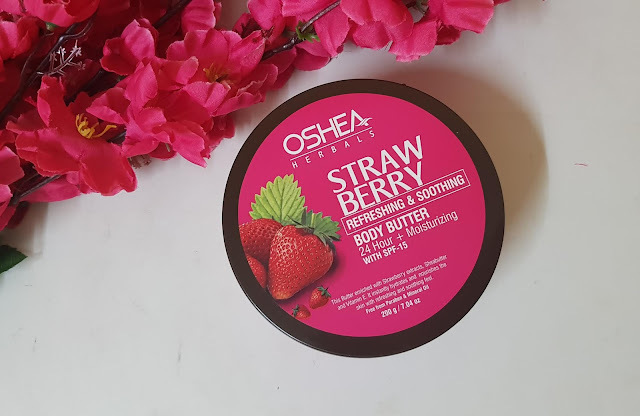 Oshea Herbals Soothing and Refreshing Strawberry Body Butter is integrated and arrives in a pink container which is very inviting yet contenting and is a tub packaging which shuts tightly. The tub is bit big so might be difficult to carry it while travelling. The body butter is light pink in colour having sweet smell of strawberries to it. It is thick in consistency and does spreads easily onto the skin. Little goes a long way. 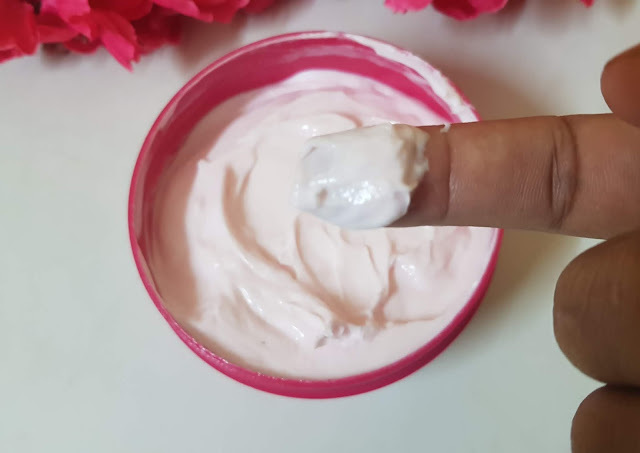 The body butter spreads easily onto the skin and is not at all greasy or sticky and gets absorbed into the skin quite easily, The sweet smell of strawberries does linger around for a while, which I don't mind at all. It does provides good moisturisation to the skin which stays for 4 to 5 hours and needs reapplication and I don't mind it as I love the smell a lot. Apart from that it provides a very subtle glow to the skin which is temporary and disappear after few hours. I am in love with this these days. It's a good body butter not at all heavy on the skin. Oshea Herbals Soothing & Refreshing StrawberryBody Butter Review! 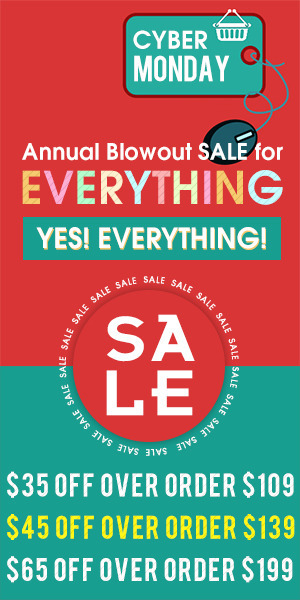 Bit Affordable as you get huge quantity in this amount. Free from Parabens, mineral oil etc. Have goodness of strawberries, vitamin E, shea butter, cocoa butter etc. Have SPF 15 to it, it's good as you need SPF during winters too. Spreads and gets absorbed easily. Non greasy or sticky. Not heavy on skin. Gives temporary glow to the skin. Tub packaging which can be unhygienic. People who are not into fruity smell won't like it fragrance. The Oshea Herbals Strawberry Body Butter makes your skin softer and easy to manage as it provides extra treatment for dry and dull skin. It recharges and repairs the skin cells for its replenishment. IBN RECOMMENDATION: Yes if you love the strawberry smell.